The pay round in 2017-18 saw the strongest pay rises for six years in collectively agreed settlements as negotiators successfully responded to peak inflation, low unemployment and record vacancies. But union negotiators have also been busy working on other factors to improve working conditions. The 2017-18 pay round had more “vim” about it, as the level of pay settlements rose against a backdrop of higher inflation and a tightening labour market. The headline figures (a 2.75% median increase on lowest basic rates, 2.5% on what most grades or workers) were the highest for some years. Some of the main factors contributing to that outcome were highlighted in Workplace Report last month, from minimum/living wage increases in the region of 4%, to long-term deals, explicit links to RPI or CPI inflation, and the loosening of public sector pay restraint. It also featured deals where equality, pay progression, job security and pension improvements brought added benefits. The chart below shows how frequently these and other topics found their way onto the pay settlement agenda, although it does not mean all of these deals resulted in some sort of substantive improvement. A summary of these and other settlements can be found in the online LRD Pay Survey. The broad pattern is similar to that reported in last year’s LRD Pay Survey, although with more pay deals that included a cash element; or focussed resources on lower-paid staff (not necessarily just the lowest-paid); and more occasions when the deal’s impact on pay additions was mentioned. In a considerable number of cases, negotiators were committing themselves to reviewing current entitlements. Some of these changes could simply be down to having a different set of settlements in the frame for this year’s pay survey (including English colleges applying the Association of Colleges’ recommended 1% with a £250 cash underpin). However it is difficult not to see the effects of a tighter labour market playing their part in some 2017-18 deals. For example, Tesco Distribution (Avonmouth) implemented the second stage of a two year agreement in February with a 1% increase to all hourly rates, but there was also a further 33p an hour “Local Market Rate” adjustment for warehouse/clerical staff and drivers, making it worth up to 4.6% for the lowest paid (together with the the 2.5% increase in the first stage of the agreement, that’s a 7.1% increase in the first year). Another transport company, Yodel, applied a larger increase for transport staff (2.6% rather than 2.2%, or a 6.3% rise to £8.45 an hour for those previously on £7.95) reflecting a response to market forces and achieving rate parity between LGV 2 & 3 lorry drivers following a strategic review of van driver rates. Elsewhere in the transport sector, there was a 10% rise at Orkney Ferries (the second year of a three-year agreement) in April, in recognition of the pay gap between current pay rates and average pay as identified in a Pay Comparator study. In retail, the Heart of England Cooperative Society gave a 4.4% increase for Customer Service Assistants and Supervisors (coupled with a 2% rise for all other retail staff and a reduction in Sunday overtime premium). But it also agreed to rejoin the Co-operative Employers Association National Agreement next April, recognising that its pay rates have fallen behind, and its benefits no longer aligned with competitors. In manufacturing, workers on Staffline Recruitment contracts at Pirelli had a 5% pay rise in January; but in addition, those previously on zero hour contracts are now employed on permanent contracts (some by a new employer who was taking over part of the existing contract). In the public services sector, unions are working with Sodexo Justice Services to improve recruitment and retention; the Health and Safety Executive included a revised relocation package in its pay deal which also provided for increases of between 1.5% and 5% for certain disciplines (dependant on recruitment and retention challenges, where benchmarking data shows a position is outside target market ranges); and the Natural History Museum established a staff Rental Deposit Loan Scheme in recognition of the costs associated with private rental accommodation, such as initial deposit, first month’s rent and other fees. Pay additions like premia and allowances got a mention in just under a quarter of deals (an increase, compared with a fifth in the last pay round). In most cases, it was simply to confirm that the negotiated pay rise “flowed through” to all or most pay additions. There were also some cases of employers deciding to consolidate or “recycle” pay additions into basic pay (to help raise minimum pay rates). Nevertheless, around one in 20 deals in the survey made their pay additions more valuable than before. • Tesco Reading Distribution Centre (overtime rates for warehouse, clerical and maintenance workers increased from £1.25 to £1.50). • Oxford City Council (reinstatement of weekend enhancement rates at £1.33 and £1.66 an hour). • compensation for field staff travelling time (Capita TVL Postal Grades). Just under a fifth of deals prioritised the lower paid — again up slightly on last year’s survey. In most cases that was either to meet statutory or voluntary Living Wage obligations and commitments. However, the pay round also saw employers targeting rewards at staff further up the ladder or taking steps to maintain differentials. For example, at DHL Rugby (TK Maxx Contract), there was an 8.2% increase to the Grade 2 rate of pay to align staff on this rate with the current Grade 1 rate of £9.57 an hour, while staff on Grade 1 receive a pro-rated non-pay increase equating to 3% in order to allow all staff to be on the same rate. Under the third stage of a three-stage two-year agreement at security group G4S (RBS), both London and national staff saw increases to minimum rates based on the Living Wage Foundation’s Living Wage, but differentials were maintained at 6.25% for Team Leaders and Supervisors ( for new Living Wage rates from November 2018 see page 4). Steps were also taken to maintain differentials at Curzon Cinema, International Fish Canners, and Turnberry Hotel. A flat-rate increase or, more typically, one with an underpinning minimum cash increase or some form of cash lump sum, featured in 17% of deals, up from one in ten last year. The October 2017 pay rise at Guardian News and Media (Guardian Media Group) was one example, a flat-rate pay increase of £2,400. And after industrial action at the Thirteen Group housing association, a two-year pay deal was agreed with flat-rate increases of £530 each year from 1 April 2017 and 1 April 2018 (equating to between 2% and 3%). As part of the deal, over 400 maintenance staff previously on four separate rates of pay (due to legacy of company merger) also saw their pay rates merged upwards in exchange for voluntarily taking part in multiskilling agreement, resulting in some trade staff receiving more than 20% over the two-year agreement. Changes in working time, often improvements, were one of the strong trends reported this time last year and they continued to play a very important role in the 2017-18 pay round — just over 12% of deals addressed this issue in one way or another. It’s the same percentage as has been recorded over a number of few pay rounds, confirming the importance that negotiators and union members place on these issues. • measures for better-managed overtime. Bonuses and incentives seem to have been a little less common as a bargaining topic in 2017-18, getting a mention in just under 7% of deals. For example there was a 2.5% staged increase for Air Products (Liquid Bulk Drivers), but during the course of the agreement, a reward incentive of 4% was to be introduced. 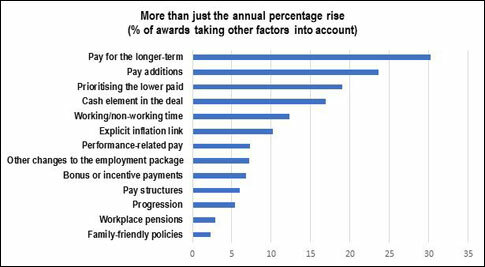 Performance-related pay was an issue in around 7% of 2017-18 deals, the same as in the 2016-17 survey. Difficulties with the system were encountered at Defence Equipment and Support (see box), but it is well established both in the civil service and finance. Pay structures were changed or under review in around 6% of deals, the same as in 2016-17. As part of the English Heritage pay deal, it was agreed that there would be a review progression, performance-related pay and base pay. Pay scale shortening is another common line of negotiation. One in 20 agreements specifically mention progression. That was the case at Royal Botanic Gardens (Edinburgh) where, alongside a 3% headline increase, there were additional contractual progression payments and “balloon payments” to ensure the pay maximum is reached within five years. Negotiating around the size of the pay bill increase, rather than a percentage or cash increase in pay rates, is unusual – except in the finance sector or in public sector organisations subject to the UK or Scottish governments’ public sector pay policies. It often coincides with a system of performance-related pay in which individuals’ pay rises are disconnected from adjustments that may or may not be applied to pay scales, and may include performance bonuses that are not consolidated into pensionable pay. More than one in 10 public sector awards were agreed on a pay-bill basis in 2017-18. They had a median pay bill increase 1%, but with some bigger individual deals (see below). This form of bargaining was less common in the private sector, where it accounted for just one in 20 deals. They had a median pay bill increase of 2.55%, somewhat lower than private sector pay rises generally (where the median increase was 2.75-3.0%), but potentially involved bigger performance-related rises for some staff, and on the downside nothing for “poor” performers. Defence Equipment and Support (DE&S) is an arms-length Ministry of Defence body employing around 12,000 civil servants and military personnel, headquartered in Bristol. Earlier this year it presented the unions with a performance-related pay offer which they found impossible to accept, despite going well beyond the 1% pay cap. The DE&S offer involved a 5% pay bill increase, backdated by four months to April, split between 2.2% for consolidated pay rises and 2.8% for unconsolidated awards. Individual pay rises ranged from 1% to 10% depending on performance and salary position relative to market benchmarks (with higher increases for those furthest below their benchmark). Salary band minima and maxima were unchanged, except at Administrator/Specialist level (where the minimum was uplifted to £15,144 in line with the National Living Wage for phase 1 Industrial apprentices on 37 hours). Non-consolidated performance awards worth from 2.4% up to 16% applied to approximately 70% of staff. Union discontent focused on DE&S’s approach to performance management, which was rejected by 96% of Prospect members voting in a ballot earlier this year, while 89.5% rejected the approach to reward set out in the 2018 pay offer. The union argues that the performance element, using “relative and guided distributions”, leads to unfair, potentially discriminatory ratings while gobbling up huge amounts of management time. The union also complained that it had not been allowed proper scrutiny of the market benchmark data used. The PCS union called for the removal of the “punishing” performance management system, and warned that staff were flocking to join the union. Other public sector employers with an above-1% pay bill increase included: the National Physical Laboratory (2.75%); Ordnance Survey (2.6%); UKAS (2.3%); the National Audit Office (2%); and the Bank of England (1.7%). The Scottish Government agreed a pay-bill increase of 5.71% for its own staff, with similar or higher pay bill rises at the Scottish Courts and Tribunals Service, Registers of Scotland, Scottish Natural Heritage, Skills Development Scotland, Scottish Enterprise and the Scottish Parliament. In the private sector, pay-bill deals (often designed on a performance-pay and market-benchmarked basis) were once again in evidence at a number of banks, but also in a range of other sectors and companies including Ford salaried staff (4.5%); Moto Hospitality (3%); Retail Co-ops (Managers) (2.5%); Telefonica UK managers/professionals (2.5%); BT managers, professionals and salespeople (2.5%); Doppelmayr Emirates Air Line Cable Car (2.64%); Co-operative Travel Care (Thomas Cook) (3.65%); Co-operative Group (Store, Team & Post Office Managers) (2.5%); the Centre for Health and Disability Assessments — CHDA (Maximus) (2%); and the National Trust (England/Wales/Northen Ireland) (4.5%). Eye-catching as they are, improvements in family-friendly policies are not as common as might be expected. In the 2017-18 pay round, just over 2% of deals included a measure of that sort. Examples included an increase in the value of maternity pay to 65% of earnings plus statutory maternity pay at confectionery group Mondelez, where it is now available for seven and a half months (rather than 12 weeks) following the first six weeks, which are paid at 90% of earnings. At Santander Technology, alongside a 2.3% across-the-board pay rise, paternity leave was doubled to four weeks and fathers/partners also eligible for paid leave to attend two anti-natal appointments; and foster parents now receive two weeks’ paid leave under a new fostering arrangement.